Until I received the Hamilton Beach Set 'n Forget® 6 Qt. 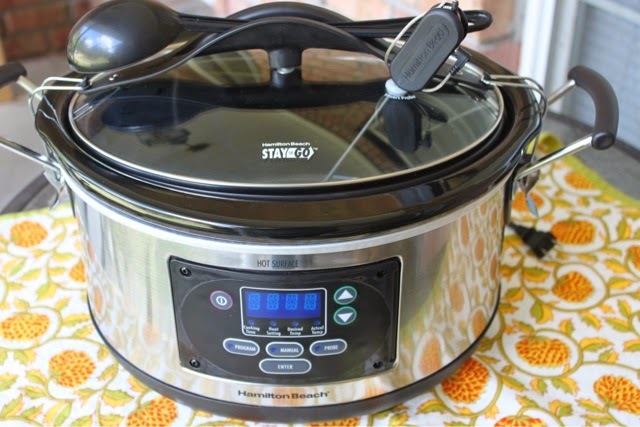 Programmable Slow Cooker With Spoon/Lid, I had never owned a programmable slow cooker. My other slow cookers have basic settings- low, high, and keep warm. So, despite the fact that slow cookers are designed to be a worry-free cooking method, I didn't feel like I could throw ingredients into the slow cooker and let them cook for the nine-plus hours that I am away from home because of the possibility of overcooking my food. With the Hamilton Beach Set 'n Forget® 6 Qt. Programmable Slow Cooker With Spoon/Lid, I have numerous cooking options: first, we have the manual option that I'm used to, next is the programmable option which cooks to a certain point and then automatically switches over to the keep warm mode, and, finally, the probe option for large pieces of meat. Before cooking, insert the probe into the meat and set the desired internal temperature. When the temperature is reached, the slow cooker will move into the keep warm mode so you don't overcook your meat. This is perfect for people like me who are away from home for long periods of time. I once came home from work to find a hockey puck instead of a roast in my slow cooker. Overcooking won't be a problem now. I've owned several Hamilton Beach slow cookers in the past but this is the only one in my collection that includes a latch and spoon. I'm always hesitant about carrying a slow cooker of food to events because of the threat of it spilling in my car. One of my co-workers had the misfortune of having her slow cooker spill chili all over the front floorboard of her car as she was making her way to one of our work events. Those accidents won't happen with these latches. To test this slow cooker, I wanted to try something a little outside of the norm of slow cooker meals by testing a bread recipe. First, I lined the slow cooker with parchment paper that was then sprayed with cooking spray. I added ten frozen yeast rolls and programmed the slow cooker on low. The rolls needed to thaw and rise for 1-1/4 hours. 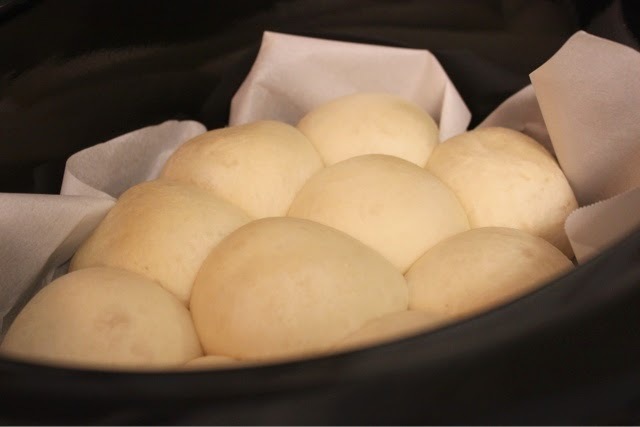 At the end of the rising period, the rolls were fully risen and ready to be baked in the slow cooker. I set the slow cooker to the high setting for another hour and 15 minutes. At the end of the cooking period, you can see that the rolls had browned around the edges while the tops were still pale. As a person who always burns the bottom of my bread, I was happy to see that the bottom of these rolls were not burned but a nice, golden brown. The rolls were fully cooked at this point, but I chose to brown them in the oven. I picked up the rolls using the parchment paper and put them on a baking sheet. I spread on a little butter and put them under the broiler of my stove for a minute or so to brown the tops. 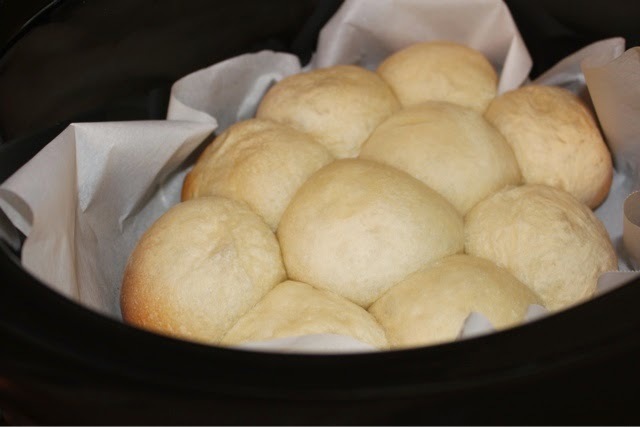 I was so pleased with the results of "baking" my rolls in the slow cooker. 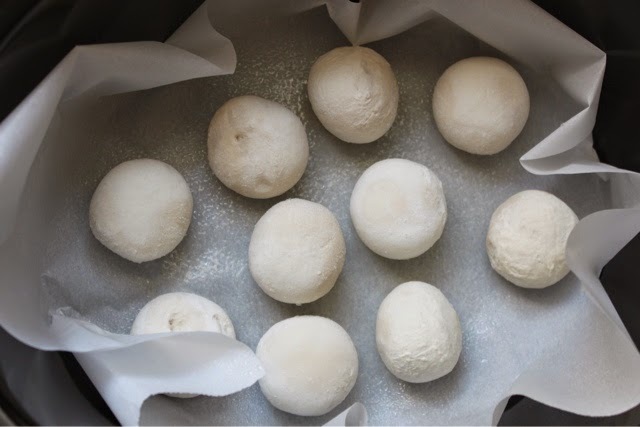 It will definitely be my go-to method for baking bread as it frees up the oven for other dishes especially on busy cooking days over the upcoming holidays. I'm looking forward to many more delicious experiments with my Set 'n Forget® 6 Qt. Programmable Slow Cooker With Spoon/Lid. Line the bottom of a large slow cooker with a circle of parchment paper. Lightly spray with non-stick vegetable spray. 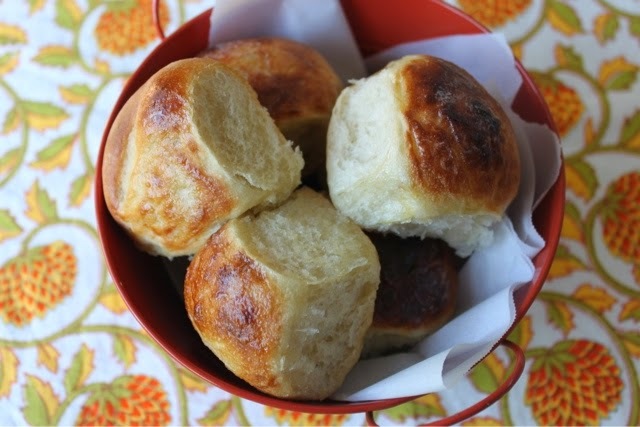 Arrange frozen rolls in slow cooker. Cover and cook on low setting for about 1-1/4 hours, until rolls have thawed and risen. 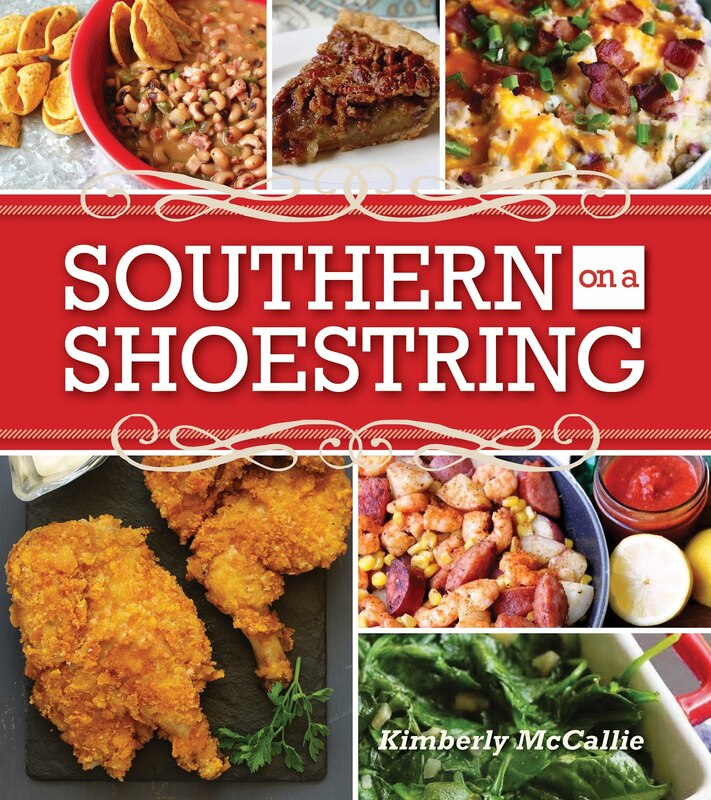 Turn slow cooker to high setting. Cover and cook for 1-1/4 hours, until set. For a more golden finish, remove rolls to a baking sheet; broil for 90 seconds, or until golden. Makes 8 to 10 rolls. Would you like to have a Hamilton Beach's Set 'n Forget® 6 Qt. Programmable Slow Cooker With Spoon/Lid of your very own? You're in luck because Hamilton Beach has generously offered to let me host a giveaway for one of my lucky readers. Enter in the widget below. Please give it a few moments to load. Deadline: November 02, 2014. Disclaimer: I received this product for review through the Hamilton Beach Ambassador Program. However, the opinion expressed here is my own. Love the dinner roll idea!!! For winter, baked potato soup! Burgundy Beef, EASY & YUMMY!!!! Roast, either pork or beef, with baby carrots, new potatoes, onions, and celery and a package of onion mushroom dry soup mix. Yummmy. 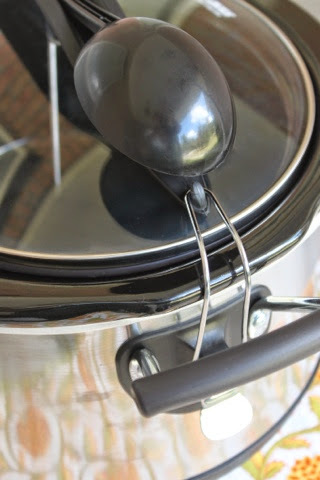 I love making roast in the slow cooker--so easy and delicious. best way to cook dried beans! I never knew you could cook rolls in a slow cooke . Love the dinner roll idea!! Chicken soup made from my dehydrated foods. Pot roast is the only thing I have ever been able to make before my cheap slow cooker took a turn for the worst but, I look forward to making more fun things if i win!! I am with melissa. A slow cooker is the only way I do dry beans. Has to be a hearty rabbit casserole. And maybe some of those rolls to go with it they look delicious. Stew with tons of veggies! My favorite slow cooker meal is a cauliflower red lentil curry! I never knew that you can bake rolls and bread in a slow cooker. Looks awesome, love making ham and bean soup! My favorite slow cooker meal is shredded bbq chicken for sandwiches. Yum! That's a hard one because I do so many things in my slow cooker, but probably fresh peas or pintos! Really, really good. We like to make ham and beans or any soup really. This is a nice crock! My favorite thing to make is a think beef stew, especially this time of year when it is getting colder. Beef Stew. Yum yum yum. I have so many! Tonight I made an orange pork! Hard to pick one as I use my slow cooker a lot. My grandkids would pick chicken tacos or my spaghetti sauce. I like mushroom barley stew the best. Lately, I have been enjoying slow cooked whole chicken...broiled a bit to brown the first night, then what's left makes broth and a soup for another meal or two. My favorite slow cooker meal is a pork roast. Slow cookers are good for so many things from main dishes to desserts and bread as you have shown. This would be a nice win. A slow cooker is always a good thing. This would be a blessing! My little car has been nicknamed "little burrito" because a slow cooker full of Mexican Soup tipped over in my trunk and seeped down into crevices of my car. Would love one with a latch and temperature probe! My favorite slow cooker meal is BBQ ribs. Those dinner rolls look amazing! Meatballs and spaghetti sauce! Sure would love to try these dinner rolls. This looks like an awesome appliance! My favorite slow cooker meal is pulled pork! My favorite is slow cooker french toast.